panel/breaker repair & install, indoor & landscape lighting install, lighting repair, appliance circuits install, and more! Mr. Electric is a full service electrical company focusing on residential homes and light commercial jobs for all of Metro Atlanta. As one of the world’s largest and fastest growing electrical companies, Mr. Electric provides system upgrades, indoor and outdoor lighting design and installation, wiring of ceiling fans, inspections, and much more. It all starts with a TrustDale electrical service must - up front pricing. You’ll know the price before the job begins. Mr. Electric also offers Advantage plan member pricing that allows you to take advantage of deep discounts every time you choose Mr. Electric. Mr. Electric has been serving Metro Atlanta for over 20 years with quality service performed by well trained professional technicians. Whether trouble shooting electrical problems in your home, or adding state-of-the-art upgrades that save you money, it’s Mr. Electric’s desire and intention for you to have an exceptional experience. Their experts provide you with the information to make informed decisions, and work alongside you to decide on the best possible solutions for all your residential and commercial electrical needs. Mr. Electric is committed to providing quality electrical service backed by a real lifetime labor warranty. Your experience begins with a polite, efficient and trained local person answering your phone call. Your call is dispatched, and to save your time, you’re served by the professional electrician nearest you. Mr. Electric’s in-depth, ongoing training means they get it right the first time. Background checked and drug free, their technicians are available for 24-hour emergency service at no additional charge! 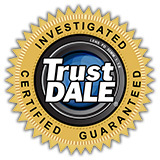 With a combined 100% satisfaction and the TrustDale Make It Right Guarantee, you simply can’t go wrong! Products & Services: panel/breaker repair & install, indoor & landscape lighting install, lighting repair, appliance circuits install, and more!